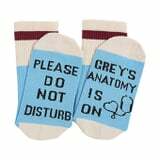 You Need These Grey's Anatomy Stocking Stuffers - STAT! Now on its landmark 15th season, Grey's Anatomy is the gift that keeps on giving for devoted fans everywhere. Speaking of gifts, why not show your person some love with Grey's swag that they can appreciate this holiday season? Grey's Anatomy fans are all about feeling their feelings, so they'll certainly appreciate a small but meaningful gift that celebrates the show's most sentimental moments. Trust us, you can never go wrong with novelties that flaunt a classic Cristina or Derek quote from the medical drama! Read on to browse our favorite Grey Sloan stocking stuffers, from classy bracelets to cozy socks.